On April 18, Oyasama’s 219th birthday was celebrated. Many followers returned to the Parental Home for the event. 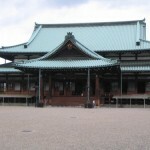 The Shinbashira served as chief officiant for Oyasama Birth Celebration Service. After the reading of the service prayer, the Kagura (masked dance) and Teodori (dance with hand movements) were performed. Followers sang the Mikagura-uta with joy in their hearts. 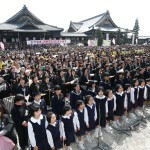 Following the Service was the “Joyous Chorus,” which presented the “Oyasama Birth Celebration Song” and five other songs, creating a festive mood in the Inner Courtyard of the Main Sanctuary. Wear Red on Oyasama’s Birthday!